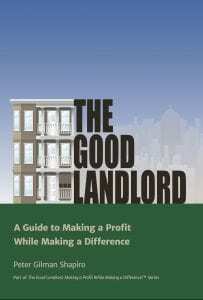 The Good Landlord: A Guide to Making a Profit While Making a Difference By Peter Gilman Shapiro. The Good Landlord Publishing, 2016, 284 pp., $19.95 (paperback); $8.99 (Kindle). Purchase a copy here. When I picked up Peter Shapiro’s book The Good Landlord: A Guide to Making a Profit While Making a Difference, my first thought was, “What happens when you can’t do both, or have to choose one over the other?” My cynicism is a product of 46 years of experience as a community worker in a small city in upstate New York, beginning with decades of work as a tenant organizer alongside my wife, Maria, which morphed into board- and committee-level activities with grassroots nonprofits focused on affordable housing development and management. But cynicism is not full-blown pessimism. I was pleasantly surprised to find The Good Landlord to be a refreshing antidote to the trendy TV shows that make housing speculation a virtue, and the infomercials that extol greed as the basis for flipping houses. This book doesn’t try to address the ilk of landlord that follows those shows, but it is written to appeal to a significant segment of landlords (overwhelmingly small-scale ones) who are willing to accept a more modest return on their real estate investment. Many of these landlords practice enlightened self-interest for reasons both practical—keeping rents affordable and providing timely repairs significantly reduces costly apartment turnovers—and personal: a positive sense of well-being and pride in a neighborhood (which also maintains long-term property values). Shapiro is very open about discussing how human frailties produce frustrations that fuel destructive anger (from both landlords and tenants), and he offers recommendations on how to prevent this, as well as contain it when it boils over. He urges landlords to be sensitive to difficulties tenants may face that can affect their conduct (particularly their ability to pay rent in a timely manner), and to be flexible when negotiating repair schedules and rent payments. Shapiro bases his insights on how to handle the tensions inherent in landlord/tenant relationships on his lengthy professional experience in mediation and conflict resolution with landlords and tenants, and he buttresses these with references to publications by other professionals in the field. He addresses evictions from a landlord’s perspective as an unfortunate, but ultimately practical last resort when negotiations break down. It’s worth remembering that to a tenant, an eviction means the landlord is resorting to a nuclear strike. Tenant fears about eviction (and even just the knowledge that it is a very real option for a landlord) often trigger hostility that at best postpones the inevitable. A summary in an appendix of the devastating impact of homelessness on families who are evicted as well as on their surrounding communities would have been more appropriately explored in the discussions about evictions in the main narrative of the book. Shapiro is frank in outlining the unequal balance of power in the landlord/tenant relationship that gives rise to these tensions, and traces the roots of this inequitable relationship (and even the terms “landlord” and “tenant”) back to medieval Europe. He explains the positive changes in the U.S. that have occurred over the last seven or eight decades that modify and partially ameliorate this inequity by, for example, setting housing quality standards and regulating eviction procedures. It has taken incredibly persistent organizing effort by tenants and allied economic justice advocates, including labor, civil rights, religious, neighborhood, and good government organizations, over longer than my lifetime to achieve those positive changes. Unfortunately, Shapiro makes no mention of tenants’ role in the economics of renting. Tenants are mute participants who have neither real control nor earn a financial return in a relationship that uses their rent to accrue equity for their landlord. The term equity broadly means interactions that are just and fair, not just the monetary value of a financial investment. This broader concept needs to be more basically incorporated in the economics of a healthier landlord-tenant relationship. A good landlord will be a good neighbor and citizen and responsive to his/her tenants’ housing needs by following the precepts of this book, and I applaud these efforts. However, I would like to read a sequel in which an exceptional landlord will step out of this power-imbalanced, post-medieval paradigm to work with others to change the paradigm more fundamentally. Thank you, Shelterforce and Roger Markovics, for your review of my book, entitled: The Good Landlord – A Guide to Making a Profit While Making a Difference. I particularly appreciate Markovics’ mention of the book as “a refreshing antidote to the trendy TV shows that make housing speculation a virtue, and the infomercials which extol greed as the basis for flipping houses.” Thank you. The Good Landlord gives voice to the many landlords, particularly smaller ones, whose actions help vulnerable tenants avoid eviction and housing instability. Beyond urging landlords to be sensitive to tenant difficulties, Markovics highlights the book’s basic premise — that it’s in landlords’ enlightened self-interest to do this. Landlords accept more modest returns not only because “keeping rents affordable and providing timely repairs significantly reduces costly apartment turnover,” Markovics reminds us, but due to “a sense of pride and well-being in a neighborhood (which also maintains long-term property values).” This point may seem obvious. Unfortunately, it is too often learned the hard way by landlords who may not see what’s in their actual self-interest. For the many landlords lacking professional training or help – most of us for that matter – the conflict resolution and relational skills we need can be difficult to acquire and execute successfully. As a result, reported by landlords whose bad tenant relationships drove up the cost of for-cause eviction cases, the risk of economic loss, foreclosure or even bankruptcy is real. My book responds to the challenges faced by well-meaning landlords wanting to avoid costly tenant battles when pursuing for-cause evictions. More than to save time and money, The Good Landlord offers landlords a path to greater peace of mind in these tough situations. Although the book doesn’t advance the argument that paradigm shifts to redress the landlord-tenant power imbalance should be pursued, it does show how much more can be done to meet tenant needs within the current paradigm, which isn’t nothing. Keeping rents affordable, being flexible with payment plans, or accommodating additional occupants make a real difference! Super-good landlords mentioned in the book go even further, namely, to voluntarily reduce arrearages, advocate for tenant services, help with family matters or whatever else will keep at-risk tenants housed and stable. Highlighting these practices should be recognized as valuable whether or not these landlords “step out of this power-imbalanced, post-medieval paradigm to work with others to change it more fundamentally,” as Markovics invites. It is uplifting to acknowledge how many landlords do act more compassionately than would be expected, albeit in the current paradigm. Programs across the country that incentivize tenant-friendly practices — such as the Landlord Liaison Project in Seattle, WA — point us in the right direction. The need to support small landlords as a force for good – they own roughly half the units in the US by the way — should be recognized and met. That said, I agree with Markovics that the predicament of low income tenants caught unsustainably in the current paradigm should be highlighted – as should be the recognition that much can and should be done to redress inequities perpetuated by this paradigm. An outstanding share! I have just forwarded this onto a co-worker who haad been dong a little research on this.